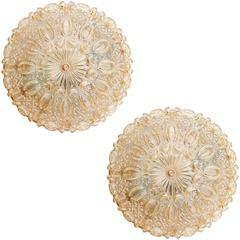 Pair of brass flush lights with glass shade by Hillebrand Lighting, circa 1970s, German. Both lights have been thoroughly cleaned respecting the vintage patina. Newly rewired, earthed, in full working order and ready to install. Light bulbs included. It is possible to install this light in other countries although it may be necessary to purchase different light bulbs suitable to local electricity. They can be used with a dimmer. This pair of vintage lights, by quality German manufacturer Hillebrand, were designed to work as either ceiling or large wall lights. While these vintage lights are from the 1970s, with the Brutalist ‘ice’ effect glass, the classical form is reminiscent of earlier Art Deco lighting. 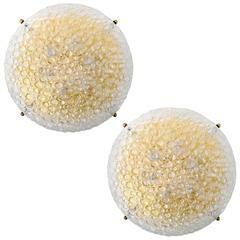 They are flush mount and have decorative solid brass bolts like a sunburst. At the focal point there is a large handmade Murano glass shade. 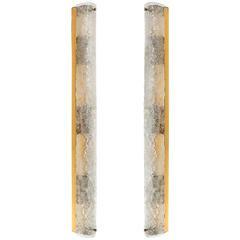 The quality glass alongside the gold tone of the solid polished brass gives this Minimalist design elegance. These lights are ideal for a range of interiors such as Art Deco, Classical, Hollywood Regency, Minimalist or contemporary; perfect for when a flush light is needed with low ceilings or as a substantial sculptural addition to a wall. The quality clear glass shade is textured and bubbled; the edge simulates a water/ice effect. The outside surface is polished to a shine while the internal surface is textured and natural with a layer of sparkling crystal shards . The result is a softly diffused light. Each removable glass shade has 3 holes along the side, and is secured to a large circular quality metal plate through 3 large decorative solid brass bolts around the circumference. These bolts screw into individual metal arms extending from the brass base. The glass shade sits securely in place and can be easily removed to gain access to change the light bulbs. The round base is in polished brass which reflects a warm tone. The base can easily be screwed to the ceiling or wall through 3 holes situated in line with the 3 arms that hold the shade. Each flush light carries 4 standard screw E 14 light bulbs up to 40 Watts each. At present fitted and photographed with 25 Watts clear Candle light bulbs. These are included in the price. These vintage lights are in very good condition. Both glass shades are in very good condition with no chips or cracks. The solid brass surfaces have the original clear lacquer on and are in very good condition, with a warm age patina and minor rubbing in a couple of internal places and tiny marks in line with age & wear. Additional dimensions: The diameter of the brass base alone is 32 cm. The diameter of the glass shade is 40 cm. Hillebrand Lighting History - The Egon Hillebrand light factory (Leuchtenfabrik Hillebrand) was established in 1881 in Germany. Read more on our Blog about Hillebrand Lighting. The solid brass surfaces have the original clear lacquer on and are in very good condition, with a warm age patina and minor rubbing in a couple of internal places and tiny marks in line with age &amp; wear.